I’ve been reading David Yaffe’s Reckless Daughter: A Portrait of Joni Mitchell. Which I just sort of stumbled upon, and which turns out to be pretty terrific. Joni Mitchell was one of those people who was on the radio constantly when I was growing up, which meant I didn’t have to think about her, because she was always right there. And then she wasn’t constantly on the radio, which meant I didn’t have to think about her either, because she wasn’t around. And then I got an Amazon Prime subscription, and I noticed that a lot of her albums were available, and I started to listen– which means I listened as a grownup, as opposed to being a kid in a car, and I thought, Whoah! And here I thought this was just a freakin’ pop song! I found a quote from an interview in which she said something to the effect that she didn’t write love songs, she wrote forensic reports into what was going on while love was happening, and yeah, that’s about right. So I’ve had Joni Mitchell running in my head for weeks now, a different song every day just about. (Today it’s “Raised on Robbery.”) And then I saw a review of the biography, and read it, and there you go. I have to say that for someone who’s male and not a musician and who missed being one of the Woodstock generation, I totally identified. Because why Joni Mitchell was on the radio and then not much on the radio had a lot to do with what artists face as they mature. When Mitchell was in her twenties, she had huge hits like “Both Sides Now,” “Woodstock,” and “Big Yellow Taxi,” which combined keen observation, musical sophistication— she’s recorded guitar parts in at least 50 tunings— and a tunefulness that made her a natural for radio. If you weren’t paying attention, you could mistake her output for pop songs. And what happened after that was that she continued to develop. Which is what artists are supposed to do. I don’t know that many musicians, but I know writers, and I know there are all kinds. Some writers are happy just to write, and it doesn’t matter what. Stories, journalism, novels, hack work released under someone else’s name— it’s all joy, because for them all writing is joy. Some, probably most, writers approach the work as craft. They are professionals, and they produce as solid a product as they know how. They’re comfortable within genre, and they often produce a clever idea within the genre, they don’t push its boundaries much. They’re the kind of people who say, “I’m just a storyteller,” assuming that they talk about themselves at all. I’m guessing their work constitutes the majority of my reading, and probably everyone else’s. And then there are the people who do push the boundaries of genre, or who rewrite genre in their own image, or who come up with something so radically different it creates a genre of its own. Sometimes they do this because they’re insanely talented, or insanely ambitious, or because they’re wired so differently they can’t help themselves. So, I imagine, with musicians. There are musicians who are happy making music, and they’ll go busking or join a Lawrence Welk tribute band or buy a copy of The Italian Wedding Fakebook and play at weddings, and it’s all happiness to them. Then there are the workmanlike guys who are the mainstays of most bands. They do their job, and they collect their split of the money, and there’s always the chance of becoming a huge success. And lastly there are the people who change the music, and we all know their names. Joni Mitchell is among them. She was on the radio, and then after a while she wasn’t, and that’s because her music evolved in a less commercial direction. She had to put a band together, and she found that the musicians who understood her best came out of jazz, and her music shifted in that direction for a few albums. And it has to be said that the jazz guys dug Mitchell, too— she played with Herbie Hancock, Jaco Pistorius, Don Alias, Weather Report, and collaborated on a whole album with Mingus. So there you go. But did these albums get in the Top 20? Did they get played on the radio? Not so much. Another issue was what happened to the Boomers. They rolled through the Sixties like a vast, unified wave, but by the mid-Seventies they were scattered out into little rivulets. If you started as the Voice of a Generation, by 1980 you were the Voice of a Sub-Section of a Group of Thirtysomethings. What artists are supposed to do is evolve, and hope their audience follows them. Musicians like Bob Dylan and Paul Simon successfully reinvented themselves every so often, and kept things fresh while retaining their audience. Mitchell had less luck, but she kept on plugging away. She couldn’t become her own tribute band, playing her music just the way it sounded in 1966, because her voice had deepened and she couldn’t sing the soprano parts any more. She’d have to hire someone else to sing her own songs. Her more recent works aren’t going to be mistaken for pop songs. They’re more didactic, less tuneful, and a lot more angry. When an interviewer asked her how she felt, she said, “Underappreciated!” Yeah, I totally get that. Well, here’s some appreciation, Joni. Live forever. The greatest female singer-songwriter of the 20th century. Plus a very unique guitarist. One year I gave all 3 of my daughters a copy of “Blue”, one of the strongest albums ever made. Ignoring gender, I would probably have to put Dylan as the greatest songwriter of the 20th century, but it’s close. 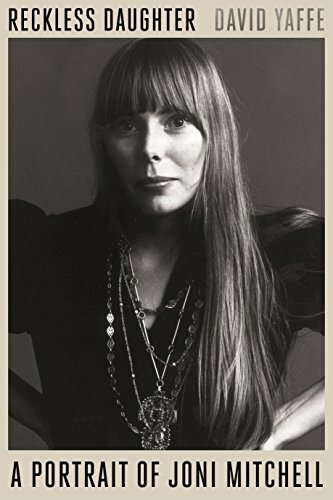 I had picked up a copy of a 2014 biography of Joni by Malka Marom for my youngest daughter, who plays and sings some Joni songs, and then this one came out – so she got both. So, you followed a post on Ursula K Le Guin with one on Joni Mitchell. Le Guin finally got appreciated after half a century in the wilderness. Here’s hoping the establishment wakes up to Mitchell soon. Mitchell pretty much already has the respect of the establishment— all her music gets very respectful reviews from all the high-profile critics. What she lacks is the audience she once had. A certain type of college woman would often ask: Blue or Court and Spark as a conversational gambit. My answer was always “Hejira.” On an unrelated matter, I did not date much. It was not just contrariness, I actually like Hejira quite a lot as a complete album. And I would put her in a tie with Van Morrison with both over Dylan, as far as talent goes. Was LeGuin “in the wilderness” for half a century? I get the feeling she was one of the “acceptable ones” as far as the mainstream crowd were concerned.